Pork. Cooked. Slowly. Celebrate this classic Texas-style dish on National Pulled Pork Day. And bring along your favorite barbecue sauce! Fun fact: Back in 2016, Sonny’s BBQ set the Guinness World Record for the “Largest Serving of Pulled Pork” — a hefty 2,012 pounds of this dish. Eventually, Sonny’s decided — along with other BBQ industry members — to designate October 12 as National Pulled Pork Day. So no matter what your sauce preferences may be — tomato-based, mustard-based, vinegar-based, etc. — just be sure to slather it on to help celebrate. Those dealing with the cheapest, toughest scraps of meat cooked the meat slowly for a long period of time — resulting in the tender, fall-off-the-bone meat that we love today. ​English settlers begin to bring hogs to the Carolinas and Virginia. ​Hernando de Soto, a Spanish explorer, brings hogs over to the New World. Whip up some nachos topped with pulled pork, make pulled pork tacos, complete baked potatoes with a dollop of pulled pork, or fill phyllo dough with pulled pork for a fun appetizer option. Even though you may not set or break a record, it doesn’t mean you can’t hold your own pulled pork games. Throw a pulled pork sandwich eating contest or have a pulled pork cook-off. Reach out to local shelters and find out if you can serve your pulled pork. If it’s a "yes," get friends and family in on the action, because the more people you can get involved, the more people you can feed. ​Pork also has more B-vitamins, iron, and zinc than chicken. ​In fact, there are twice as many pigs as people in Denmark. ​Pork is the most consumed meat at the global level. 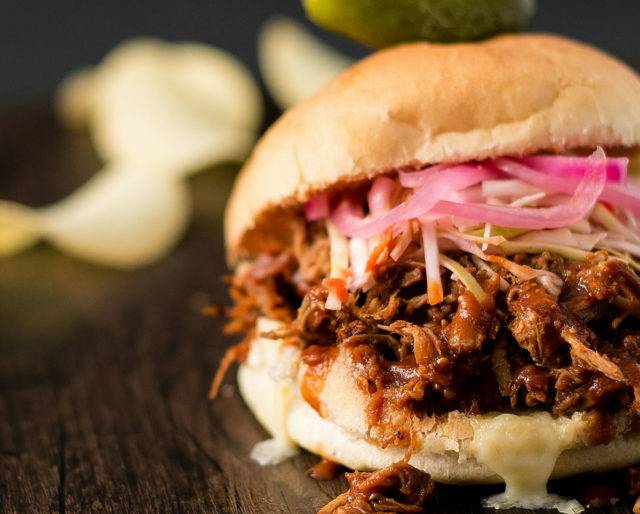 Meat lovers of all ages will love celebrating National Pulled Pork Day because, well, it’s an excuse to eat a lot of meat. Whether you just indulge at dinner or decide to go all out and eat pulled pork for lunch, too, this holiday gets meat lovers giddy. National Pulled Pork Day is a good reminder that investing in a slow cooker is totally worth it. Of course, you can slow cook up a bunch of other dishes too. So many options! Because you can prep your pulled pork the night before, you won’t have to spend time cooking the night of National Pulled Pork Day. Instead, enjoy a beer, play some games with the family, and catch up on your favorite shows.